OUR GOAL: Ensure WorldVeg and partners make a positive and lasting impact through strong partnerships, sound scaling strategies, and robust M&E systems. 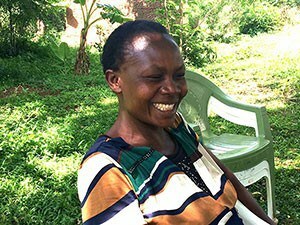 The Enabling Impact program supports the Center’s intervention designs, monitoring, evaluation and learning activities, impact evaluation, and data management to achieve faster, greater and longer-lasting impact. The program aims to stimulate continuous learning at the organizational level by sharing experiences across projects and regions, by documenting outcomes, impact and lessons learned, by storing research data in a central repository that is easily accessible to all staff, and by using this to continuously refine research priorities and intervention designs. 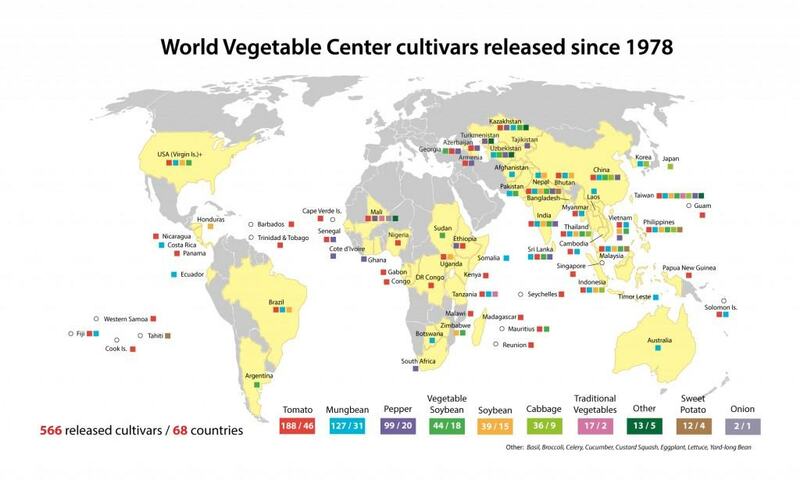 Nearly 15% of tomato and chili pepper seed sales of commercial hybrids in India contained World Vegetable Center material, benefiting an estimated 500,000 farmers. 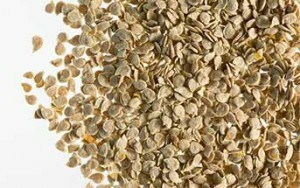 1.2 million farmers in India, Bangladesh, Pakistan and Myanmar use improved mungbean seed developed from genetic material supplied by the World Vegetable Center. Schreinemachers P, Sequeros T, Rani S et al. 2018. Counting the beans: Quantifying the adoption of improved mungbean varieties in Asia. Manuscript under review. 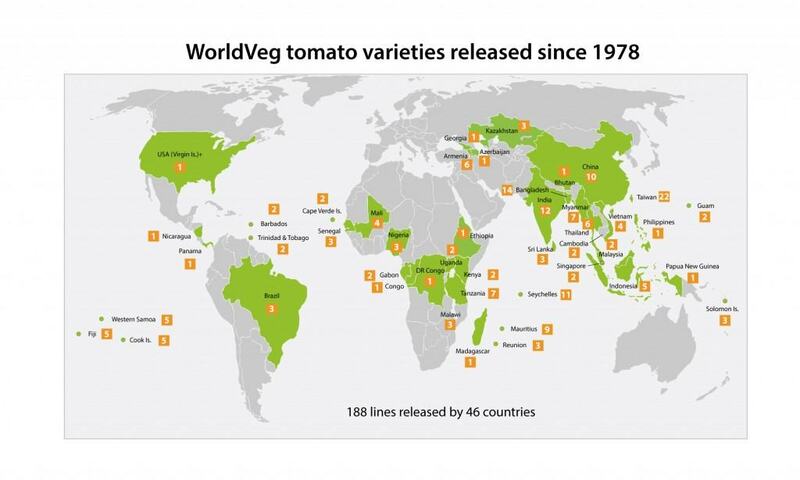 50% of tomato and 98% of African eggplant seed produced commercially in the region were varieties developed by the World Vegetable Center. These varieties generated economic gains of US$ 254 million for tomato and US$ 5 million for African eggplant in Tanzania alone. Pepijn Schreinemachers, Teresa Sequeros. 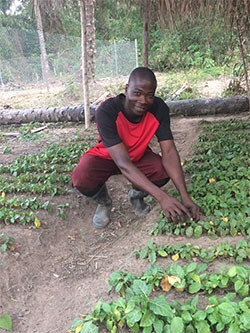 2016. International vegetable breeding research in East and Southern Africa: Adoption, impact and returns. Agricultural Economics http://dx.doi.org/10.1111/agec.12368. In Bhutan and Nepal, school gardens developed by WorldVeg and partners improved children’s knowledge of and preferences for healthy eating. Schreinemachers P, Patalagsa MA, Islam MR, Uddin MN, Ahmad S, Biswas SC, et al. 2015. The effect of women’s home gardens on vegetable production and consumption in Bangladesh. Food Security, 7(1), 97-107. Schreinemachers P, Ebert A, Wu M-H. 2014. Costing the ex situ conservation of plant genetic resources at AVRDC-The World Vegetable Center. Genetic Resources and Crop Evolution, 61(4), 757-773. Patalagsa MA, Schreinemachers P, Begum S, Begum S. 2015. 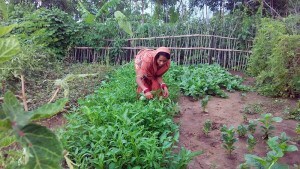 Sowing seeds of empowerment: effect of women’s home garden training in Bangladesh. Agriculture & Food Security, 4(24). Schreinemachers P, Wu M-H, Uddin MN, Ahmad S, Hanson P. 2016. 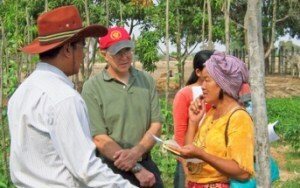 Farmer training in off-season vegetables: Effects on income and pesticide use in Bangladesh. Food Policy, 61, 132-140.